Review by Karen Topham, American Theatre Critics Association member; photo by Eric Klein. Since 1997, Blue Man Group has been entertaining crowds of Chicagoans and tourists at the Briar Street Theatre. Performance artists don’t get that kind of longevity without changing up their show every once in a while, and this week BMG introduced a show chock full of new material, most of which hits solidly to add to the joy and mystique of a visit to see these bald blue performers do their thing. If you don’t know what BMG is by now, I’m not sure what cave you’ve been living in for the last two and a half decades. Created in 1991 by three friends (Matt Goldman, Phil Stanton and Chris Wink), the Blue Men have become so iconic that they are even appearing in commercials. There are sit-down shows in several cities across the country and the world, each featuring three silent blue performers whose clownlike antics and use of sound, light (designed by Matthew McCarthy and Tabitha Rodman), and bizarre, invented instruments have defined their shows wherever they have performed. The updated BMG production features a lot more audience interaction as the Blue Men roam the auditorium looking for people they will drag onstage to help with their bits. One lucky audience member even gets to join them in playing one of their new instruments, an invention they call the Mag Bells that is played with drumsticks. (One key admonition: don’t be late to this show; BMG mercilessly makes fun of latecomers.) Other new instruments include the Light Horns (which combine sound and light, the two media the Blue Men use the most) and the Spinulum, a long upright pole-like mechanism played by spinning a disk and using a handgrip like the slide on a slide guitar. Other new features spoof modern behavior. These include a bit called “Fast Friendz!” which mocks online friendships, an “offstage” scene involving the Blue Men and virtual reality, and an animated bit focusing on our obsession with little screens. While the two video pieces work very well, the onstage “Fast Friendz!” gets old far sooner than it finishes; it’s a one-joke bit stretched out far past its ability to be funny, and it unfortunately bogs the show down just when it is getting to move quickly. All of the silly things that have long endeared BMG to audiences of all ages remain: the expressive and exaggerated use of paint, the brightly colored splash drumming, the gloriously inventive use of food (in this case Twinkies, Cap’n Crunch cereal, marshmallows, and Toblerones) both while presenting and interacting with the audience, the comical shenanigans among the three members of the cast (who on any given day might be Scott Bishop, Tom Galassi, Eric Gebow, Callum Grant, Gareth Hinsley, Michael Angelo Smith, or Brian Tavener), and the always-fascinating and powerful original music provided by three dedicated musicians. 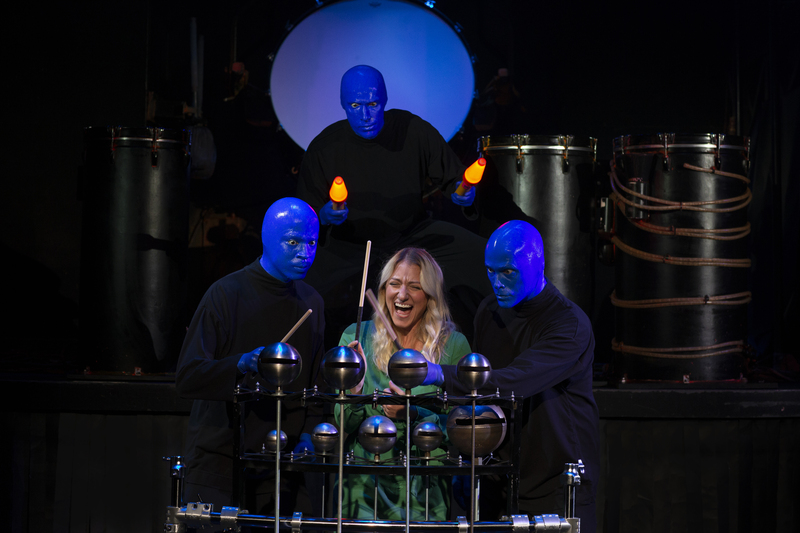 An evening with Blue Man Group is pretty much guaranteed to leave you smiling. It’s inventive entertainment of a kind you just can’t find anywhere else. I saw the show in its first year here in Chicago and have long held fond memories of those three expressionless blue men. The updated version, the first time in over two decades I’d seen the production, doesn’t disappoint. Part music and light, part performance art, part comedy, part social commentary, and partly just plain goofy, the Blue Man Group continues to be part of the fabric of Chicago. You’d have to be Scrooge not to have fun at this show. Blue Man Group is now playing at the Briar Street Theatre in an open run. Check the website for specific dates, times, and tickets. Find more information about current plays in our front page recs and at theatreinchicago.com.